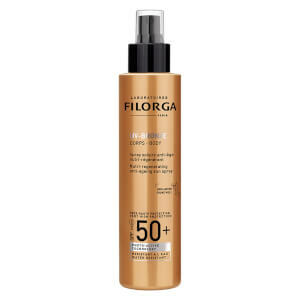 Protect skin from harmful sun exposure with the Filorga UV Bronze SPF50 Body Oil; a nutri-regenerating, anti-ageing sun spray that offers very high protection and enhances your sunkissed glow. Combining a Global Anti-Ageing Shield (a powerful antioxidant that is activated by the sun’s rays) with a collagen-boosting firming complex (a duo of Hyaluronic Acid and the brand’s proprietary NCTF®), the oil shields the skin from sun damage and strengthens the skin’s elasticity with a potent dose of hydration. Enriched with a sublimating Coconut Oil, the formula deeply nourishes skin and leaves a soft and silky finish. Shake well before use. 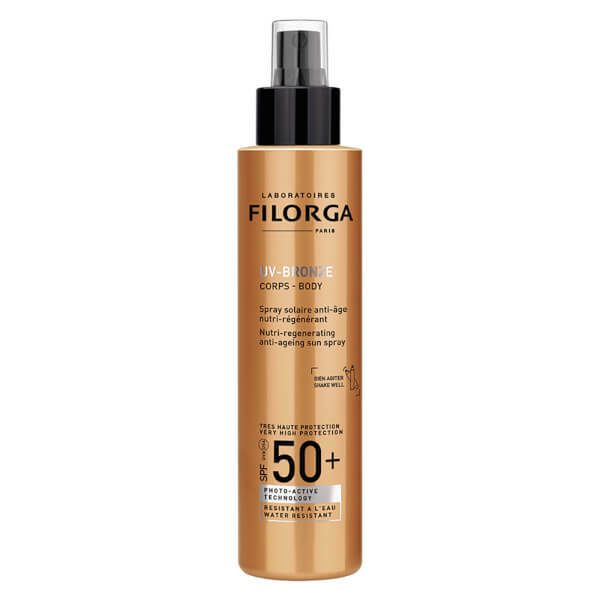 Apply the product to the body before sun exposure and repeat frequently, especially after swimming or towel dying. Excessive sunbathing can be dangerous. Avoid the eye area. Can also be used on the hair. C12-15 Alkyl Benzoate, Isododecane, Diethylamino Hydroxybenzoyl Hexyl Benzoate, Homosalate, Cyclopentasiloxane, Ethylhexyl Methoxycinnamate, Cyclohexasiloxane, Ethylhexyl Salicylate, Ethylhexyl Triazone, Aqua (Water), Trimethylsiloxysilicate, Thermus Thermophillus Ferment, Bis-Ethylhexyloxyphenol Methoxyphenyl Triazine, Alcohol Denat., Cocos Nucifera Oil, Phenoxyethanol, Parfum (Fragrance), Tocopheryl Acetate, Sucrose Palmitate, Glycerin, Triethylene Glycol, Glyceryl Linoleate, Prunus Amygdalus Dulcis (Sweet Almond) Oil, Potassium Sorbate, Hydrolyzed Soy Flour, Sodium Chloride, Bht, Glucose, Sodium Hyaluronate, Sodium Hydroxide, Citric Acid, Potassium Chloride, Calcium Chloride, Magnesium Sulfate, Glutamine, Sodium Phosphate, Ascorbic Acid, Sodium Acetate, Tocopherol, Lysine Hcl, Arginine, Alanine, Histidine, Valine, Leucine, Threonine, Isoleucine, Tryptophan, Phenylalanine, Tyrosine, Glycine, Polysorbate 80, Serine, Deoxyadenosine, Cystine, Cyanocobalamin, Deoxycytidine, Deoxyguanosine, Deoxythymidine, Glutathione, Asparagine, Aspartic Acid, Ornithine, Glutamic Acid, Nicotinamide Adenine Dinucleotide, Proline, Aminobutyric Acid, Methionine, Taurine, Hydroxyproline, Glucosamine, Coenzyme A, Glucuronolactone, Sodium Glucuronate, Thiamine Diphosphate, Disodium Flavine Adenine Dinucleotide, Sodium Uridine Triphosphate, Retinyl Acetate, Inositol, Methyl Deoxycytidine, Niacin, Niacinamide, Pyridoxal 5-Phosphate, Pyridoxine Hcl, Biotin, Calcium Pantothenate, Folic Acid, Riboflavin, Tocopheryl Phosphate, Alpha-Isomethyl Ionone, Benzyl Benzoate, Benzyl Salicylate, Citronellol, Eugenol, Geraniol, Hexyl Cinnamal, Limonene, Linalool.